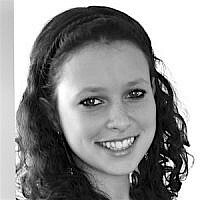 Kayla Haber-Goldstein is a 23 year old entrepreneurial designer who runs her own business. A mom of two, living in Brooklyn NY with her husband. She was born in Australia, raised in Israel, and moved to NY about 1 year ago. She runs her interior architecture business based on her degree and otherwise acquired knowledge. Kayla spends her days designing homes and offices, directing projects, and upgrading and reselling furniture in addition to writing blogs and giving design advice on Facebook.